Just the ticket for the ferry ... we were looked after very well and treated like old friends.would go again for a break if we did not live so far away! A special and unique historic building, a quality stay, a sensible price. 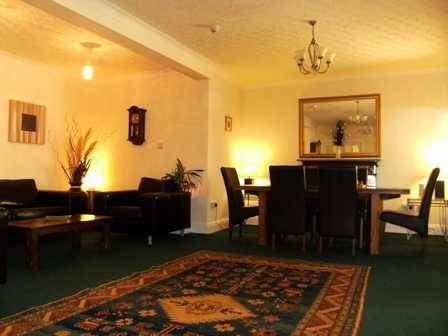 Spacious and relaxed surroundings. One mile (1 minute drive) to P&O Cairnryan ferry terminal and a 3 minute drive to Stena Line Cairnryan ferry terminal. 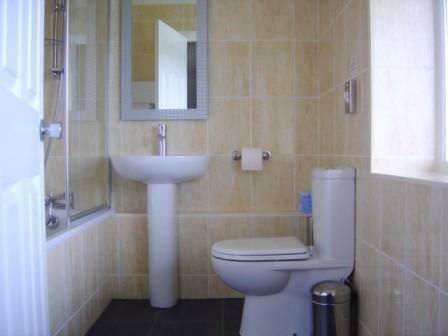 Comfortably appointed bedrooms with quality en-suite bathrooms to match. Rhins of Galloway is perfectly located between the two ferry ports of Stranraer and Cairnryan, enjoying the benefits of out-of-town semi-rural surroundings, but still within a few minutes drive of the ferries, shops and eateries. Ideal accommodation for ferry travelers, business travelers, and tourists. 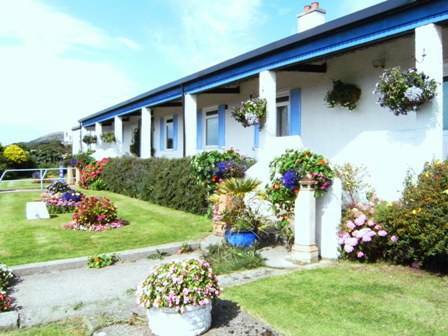 Situated on the main A77, in an acre and a half of lawned gardens, and with plentiful private car parking, there is a shingle beach and a lovely coastal walk just 20 yards across the road. 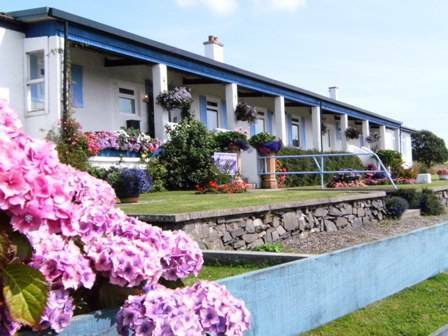 The views from the building can be enjoyed from outside in all weathers from the shelter of the covered verandah that fronts the building, and take in Loch Ryan, Cairnryan ferry port, and beautiful unspoilt farmland and countryside to the sides and rear. Privately owned and personally run, we offer quality accommodation within a hotel setting (despite the style and stature of the building, the fact that we do not operate a licensed bar or provide evening meals, means that we are defined as a Guest House rather than a Hotel). 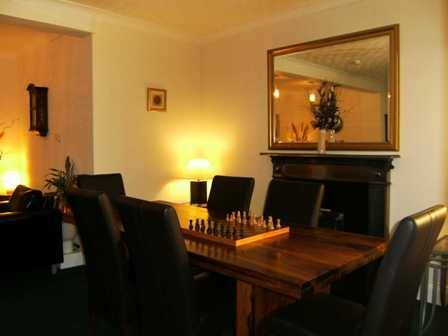 The premises are only open to guests staying with us. Opened by Princess Alice, Duchess of Gloucester in 1943, the building itself has had a variety of uses, boasting a history that can make a place feel very special. Whilst the rooms are decorated with contemporary furniture, the corridors and other communal areas mix antiques with modern design. The entire building is strictly non-smoking. Single £54-56. Double (2 persons) £90-98. Taxes (VAT @ 20%) included. Check-in from 15:00 but not possible after 23:00. Check-out by 10:30. We are located on the main A77, which connects Stranraer with Glasgow (2 hour journey). We are 4 miles north of Stranraer, and one mile south of Cairnryan P&O ferry terminal. The journey south to Cairnryan along the A77 has breathtaking views along the route, passing Ailsa Craig and the magical coastline around Lendalfoot. Ferry services connecting South West Scotland to Northern Ireland operate throughout the year from Cairnryan. P&O operate a ferry service from Cairnryan to Larne. Stena Line currently operate a service from Cairnryan to Belfast. These ferries provide for day trips and short stays to Larne and Belfast, perfect for a visit to Giants Causeway or a shopping and sight-seeing day out in Belfast. Stranraer rail station is just 4 miles away, and provides a direct link to Glasgow. Nearest airport: The nearest major airports within Scotland are Prestwick (50 miles) and Glasgow (70 miles). There is a small airfield locally at Castle Kennedy (7 miles).